Q: On September 24, the Maldives Election Commission announced the preliminary results of the presidential election. Maldivian joint opposition presidential candidate Ibrahim Mohamed Solih won the election with 58 percent of the vote. What is your comment? What are China's expectations for the future development of China-Maldives ties? A: The Chinese side congratulates the Maldives on the smooth holding of the presidential election and Mr. Solih on his election as the President. We respect the choice made by the people in the Maldives and hope that the Maldives can maintain stability and development. China and the Maldives enjoy traditional friendship. In recent years, our bilateral relations have maintained a sound momentum of growth. Our two sides have conducted mutually beneficial cooperation under the framework of the Belt and Road Initiative, which has yielded fruitful outcomes. We are willing to work with the Maldives to continue to cement traditional friendship and deepen mutually beneficial cooperation so as to deliver benefits to our two countries and two peoples. Q: During the ROK-US summit in New York today, the two sides held consultations on the declaration on the end of war and the second DPRK-US summit. President Trump said that the second DPRK-US summit will be held soon and the corresponding measures will be taken on realizing the denuclearization of the DPRK. What is your comment? A: We support and look forward to the efforts made by the DPRK and the US to step up contact and consultations, accommodate each other's legitimate concerns, continuously enhance mutual trust, promote the denuclearization of the Korean Peninsula and move forward the political settlement process of the Peninsula issue. The Chinese side has made clear its position on the declaration on the end of war many times. We believe that the issuance of the declaration corresponds with the trend of the times and meets the expectations of the people of all countries around the world, including those on the Korean Peninsula. The Chinese side supports the efforts made by all relevant parties to this end. As an important party to the Korean Peninsula issue and a contracting party to the Korean Armistice Agreement, China will play its part in achieving the lasting peace on the Korean Peninsula. Q: According to reports, on September 25, the Defense Security Service under the US Department of Defense notified the Congress of the plan on selling about 330 million dollars worth of military equipments to Taiwan, including spare parts of military airplanes and relevant logistics support. What is your comment? A: The US arms sales to Taiwan severely violates the international law, the basic norms governing international relations, the one-China principle and the three China-US joint communiqués and undermines China's sovereignty and security interests. The Chinese side is strongly dissatisfied with and firmly opposed to the US plan on arms sales to Taiwan. We have lodged stern representations with the US side on this. It must be stressed that Taiwan is an inalienable part of China's territory. No one can shake the strong will and determination of the Chinese government and people in safeguarding national sovereignty and territorial integrity and opposing foreign interference. The Chinese side urges the US side to earnestly abide by the one-China principle and the three China-US joint communiqués, immediately cancel the above-mentioned plan on arms sales to Taiwan and stop its military links with Taiwan lest it should cause more harm to China-US ties and the peace and stability across the Taiwan Strait. Q: It is reported that Pakistan's Minister for Religious Affairs met with Chinese Ambassador in Islamabad last week and raised concerns about China's restrictions on Muslims in Xinjiang. Do you have any comment on this? A: On September 19, Chinese Ambassador to Pakistan Yao Jing met with Pakistan's Minister for Religious Affairs Noorul Haq Qadri, during which the two sides had good communication on China-Pakistan relations and the China-Pakistan Economic Corridor. The Chinese side commends the efforts made by the Pakistani government to promote religious harmony. Our two sides share the same position on religious issues. In the information released by the Associated Press of Pakistan on that day, the meeting was reported in an accurate way. 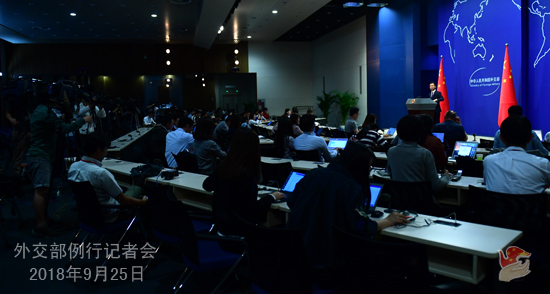 However, some foreign media made unfounded and distorted reports on the meeting. China is firmly opposed to that. The Chinese government governs and develops Xinjiang in accordance with law. A host of policies and measures have been introduced to promote stability, development and solidarity and improve people's livelihood in Xinjiang, thus safeguarding social stability and lasting peace there. Currently, Xinjiang enjoys social stability and a sound momentum of economic development with people of different ethnic groups living in harmony. Q: On September 24, the Government of the Hong Kong Special Administrative Region (SAR) Gazette published an order to ban the operation of the Hong Kong National Party. The United Kingdom, the United States and the European Union issued statements and remarks, saying that the Hong Kong SAR government's move has restricted the freedom of speech and association as well as political activities. What's your comment? A: Certain countries and institutions have made irresponsible remarks on the Hong Kong SAR government's ban on the operation of the Hong Kong National Party. We express strong dissatisfaction with and firm opposition to this. Any organization or behavior to promote "Hong Kong Independence" and separate the nation can by no means be tolerated. The Hong Kong SAR government's decision to ban the operation of the Hong Kong National Party in accordance with relevant laws and legal procedures is a due move to safeguard national security and the rule of law in Hong Kong, which falls within Hong Kong SAR's affairs and China's internal affairs and brooks no foreign interference. We demand relevant countries and institutions to respect China's sovereignty and territorial integrity, and stop interfering in the Hong Kong affairs and China's internal affairs under the pretext of "freedom of speech and association". Q: The opposition party will just come to power in the Maldives, which has been critical of China. They have also slammed some of the investment by China. In fact, the free trade agreement which was signed between the Maldives under the Yameen government and China came under a lot of criticism from the opposition party. Is China concerned because there are reports that the opposition party coming to power may just lead to renegotiation of the free trade agreement? A: With regard to the presidential election in the Maldives, I have elaborated on China's position just now. We congratulate the Maldives on the smooth holding of the general election and Mr. Solih on his election as the President. We respect the choice made by the people in the Maldives and hope that the Maldives can maintain stability and development. Meanwhile, I also said that China is willing to continue to deepen mutually beneficial cooperation with the Maldives so as to deliver benefits to our two countries and two peoples. As to China's projects and investment in the Maldives which you are interested in, the Chinese side always encourages Chinese enterprises to invest and start businesses in the Maldives in accordance with the market principles and play a positive role in promoting the Maldives' socioeconomic development. We hope that the Maldives can maintain the consistency and stability of relevant policies and create a sound business environment for Chinese enterprises' operations there. Regarding the China-Maldives free trade agreement, our two countries inked the free trade agreement in December last year. The Chinese side is willing to work with the Maldives to implement this agreement and continuously expand bilateral trade and investment cooperation so as to deliver more benefits to our two countries and two peoples. Q: The Foreign Ministers of India and Pakistan were scheduled to meet on the sidelines of the UN General Assembly. However, recently some media reported that the Indian side announced the meeting would be canceled. What is your comment? A: Both India and Pakistan are important countries in South Asia. Maintaining the steady development of India-Pakistan relations is of important significance to the peace and development of the region and the world at large. We sincerely hope that the two countries can enhance communication and dialogue, properly handle differences, improve their relations and jointly uphold regional peace and stability. Q: It is reported that Vice Admiral Shen Jinlong was recalled from the visit to the US and at the same time, a US navy ship has been denied permission to call in Hong Kong. What's your comment on that? 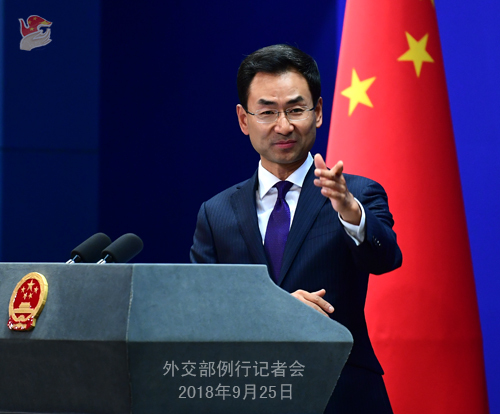 A: On September 22, Vice Director of the Office for International Military Cooperation of China's Central Military Commission has summoned the Acting Military Attaché of the US Embassy in China and lodged stern representations and protest against the US announcement of sanctions on the Equipment Development Department of the Central Military Commission and its Director. Meanwhile, relevant military officer also made clear China's stern position and explicitly announced that the Chinese side would immediately call back Navy Commander Shen Jinlong, who is attending the 23rd International Seapower Symposium and planning to visit the US. I believe this has been made very clear in the press release. 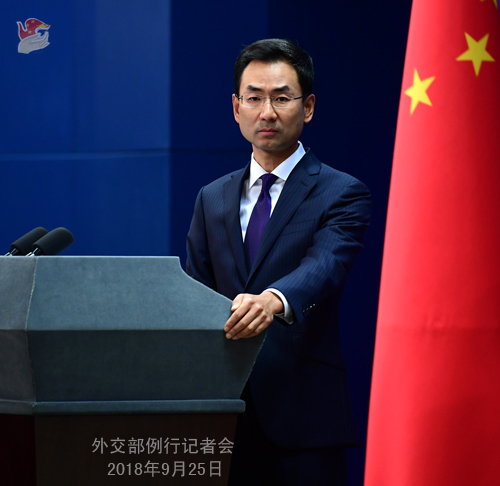 As to the issue of US warship calling in Hong Kong you asked, the Chinese side reviews and approves such request in accordance with the principle of sovereignty and in light of specific situation on a case-by-case basis.